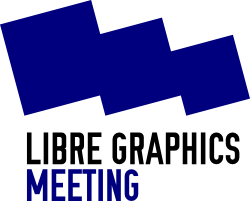 If you want to join us, please register to the Libre Graphics Meeting mailing list and let us know what you can do! Letters of invitation may be required; the local team should be able to provide the letters and (hopefully) get the language correct — e.g., clarify that the event is a “hobbyist conference” and thus does not necessitate a work visa. Tasks: taking care of team, equipment, webspace, recording conference, annotations, encoding etc. Make sure we have the right presentations, workshops, people. Make sure we have working website,internal communication tool, access to social media accounts. Secure money for the event. Make sure people who want to come, can come. Keeping the organization of the LGM 2015 on schedule.